"Once the residence of the erstwhile rulers of Shekhawat clan of Rajputs, Shahpura house today is one of the best luxury heritage hotels of Jaipur. 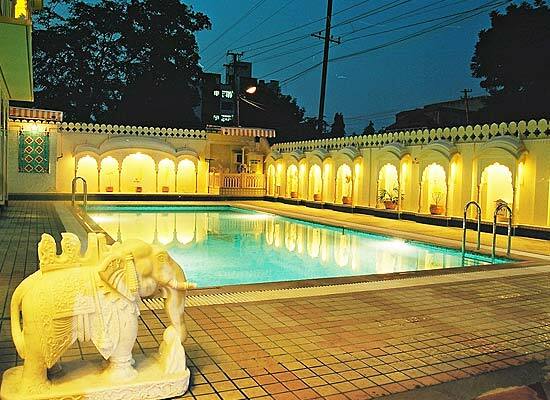 A mix of Mughal, Rajasthani and Indian styles of architecture, this property offers amalgam of old Rajputana hospitality and new-age conveniences. Just 4 km from the city center, this heritage hotel has luxurious interiors as well as exteriors. The guest rooms and suites are well-equipped. Have a comfortable stay while you savor sumptuous Indian and World delicacies. Considered to be the head seat of the Shekhawat clan of Rajputs the Shahpura House was founded by Rao Hanuwant Singh and is 200 years old. After Rao Hanuwant Singh, his descendant Rao Dhir Singh expanded the palace and refurnished the house which is now a heritage hotel in Jaipur. 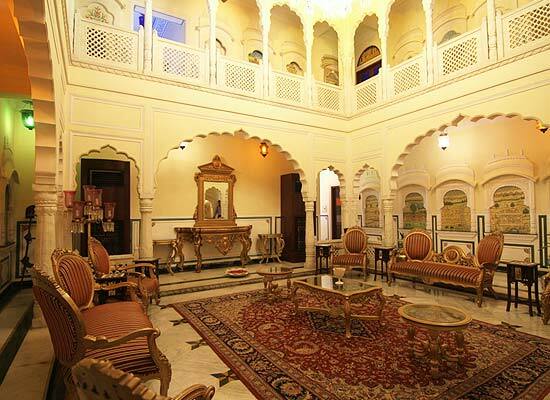 Shahpura House, Jaipur has 65 spacious and well-fitted rooms and suites, that boats of wonderful, warm interior with Rajput-inspired decoration. Accommodation comes with world-class facilities and amenities such LCD TV, satellite television, wired and wireless broadband internet access, electronic safe, direct dial telephone with voice mail, mini-bar, tea-Coffee Maker, etc. The attached bathrooms are in marble and come with complimentary toiletries. 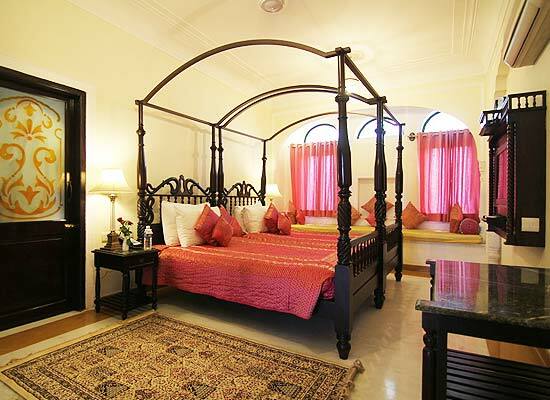 The most luxurious, extremely spacious accommodation here is the Shahpura suite that boasts of an elegant décor. The suite comes with a private terrace from where one can savor wonderful views of the city in complete privacy. The furniture is antique, the upholstery rich, and the air is chilled because of air-conditioner. The suite has an option of king-size/twin beds, has a huge sitting area and as private elevators to its floor too. This royal room has walls decorated with marble and semi-precious stones. The spacious royal suites have wonderful antique furniture, and regal fittings. The interiors and murals have a royal feel. These rooms feature private balconies with pool-view, option of king -size bed/twin bed, and air-conditioner. The arches of some balconies have been adorned with gold work and mirror work. The suites are well-furnished and have a tasteful décor. The carved pillars and frescoes take you back in time. Have a pleasant stay while enjoying contemporary facilities. Deluxe rooms are the base category rooms that too are fitted with all the modern comforts, and feature huge, clean bathrooms. 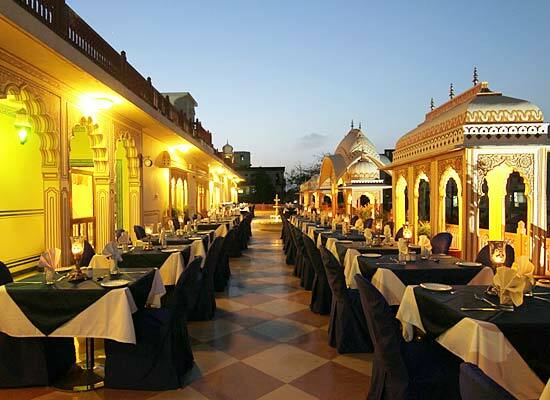 Rang Mahal Restaurant is the on-site multi-cuisine restaurant serving popular dishes of Indian and World cuisines. The meals prepared here use fresh ingredients and aromatic spices. The chef and his team use the age-old recipes of royal kitchen. The menu also includes a collection of fine beverages. The décor of the restaurant is vintage-style and warm. 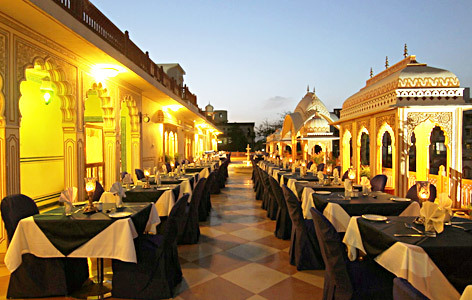 Jaipur is the city of Havelis and magnificent forts which exude the medieval aura and charm. Tourists from all over visit Jaipur to get a glimpse of its exquisite forts, intricate artwork and rich handicrafts. Also known as the Pink City, Jaipur attracts tourists from all over. The historical monuments of the city reflect the glory and grandeur of the royal Rajput era.